Transform Your Home With These Great Corian Design Ideas! Arizona Countertop Repair and Refinishing has a long-standing relationship with this countertop technology. From countertops to high-end projects, Corian© offers possibilities that simply can’t be met with granite or the like. For over 30 years Arizona Countertop Repair and Refinishing has been servicing the greater Phoenix area, fixing and installing gorgeous Corian© countertops. As Corian© has transformed into an aesthetically pleasing design material, so has our relationship with it. It is no longer a memory associated with yellowing countertop edges or poorly designed kitchen spaces. Corian© can be colorful, brilliant and add a great deal of life to any room. With the malleability of this uber-durable plastic, Corian© designers can create a multitude of design ideas that will last a lifetime. An extra added benefit? Corian© won’t collect germs and is incredibly easy to take care of and clean. Emphasis on the “so many”. Corian© is an excellent alternative to more expensive material and doubles your value by being so easily manipulated. Builders and designers are now utilizing Corian© to create anything from an incredibly sleek and functional desk to wall cladding. Imagine your next Anniversary ring made from the material, or the bookshelf in your brand new home. Across the globe this material is changing the design market and transforming the way interior decorators and contractors view spaces. Global business director of DuPont (commonly known to the paint world for producing pigment-rich colors) mentions Corian© as a way to turn design dreams into reality. With such a great malleability and natural look, it allows ideas to become reality within your home. Prefer the details? Corian© is a unique blend of pigments for color, naturally occurring minerals and acrylic resin (basically plastic, but resin sounds so much cooler). From New York to Colorado we are seeing homeowners use Corian© as their focal pieces, fireplace (or kitchen) backdrops and office furniture. With the capability of such sleek designs, many homeowners preferring the modern look are turning the material into built-in shelving units, extra large desks that double as conference tables and richly decorated wall art installations. Huh? Ok, ok. It’s a fancy way of saying ‘spreading’, in regards to light. Using Corian© can give you the leading edge in uniquely fabricated lamps or wall sconces, sure to discredit the ’50 dinner table conversations’ deck of cards you have, but hey – at least your dinner guests won’t be bored. Not so much like finding America, more like having a leg up on everyone that is paying too much for building materials. DIY has never been so simple. Homeowners and architects alike are calling this the most evolutionary material of popular building design. With a saw and extra-strong adhesive you too can find yourself blog-writing at a Corian© desk, washing mason jars in a brand new black Corian© sink or watering your Jovibarba (fine, succulent…) in a planter that doubles as an outdoor table. Home transformation is the new black, from tiny space living to ultra-sleek carbon fiber couches (made that one up), and Corian© will take your home to the next level. Transforming the way you see building materials is only half of it, it’s the sink-TV stand-plant holder-charging surface (real life alert: Corain conducts electricity) that will bring in the gold medal – and all of the jealousy. 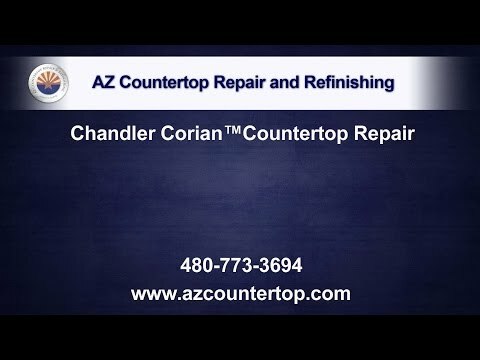 Arizona Countertop Repair and Refinishing is proud to work with, repair and install Corian© in Chandler. It’s often that people are so amazed that their entire house makes a transformation into the world of Corian© design. Contact us today!